Protective Design-included protect case which available to hold on the belt or bay, easy to carry, It is also much increased the protection The connecting plug anti-wrong inserts design, avoid missed using to failure flashlight system. A1Pro 6 Creative Color Gel Set for Godox AK-R1 Accessory Kit. These A1Pro Creative Color Gels are Round Shape Disc that made to give you creative amazing visual effect. Godox AK-R1 Accessory Kit 2019 New Version. Holds 1x Godox AD600 Portable Flash Unit. The Godox PB-600 Portable Bag for the AD600. 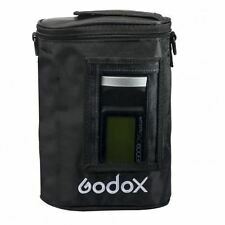 This bag protects the Godox AD600 flash from rain and knocks when used in conjunction with the Remote Flash Head. Godox AK-R1 Accessory Kit 2019 New Version S-R1 Adapter (Kit Set) is available now! Included Item List . Model number: SB150 15X20CM. Mini softbox with window openings gives softer light results. Two layers in the middle, durable softbox lining. Unless changed due to major family events or vacation. Compatible with Godox AD200 Pocket Flash Witstro AD360II AD360 AD180 Speedlite Flash. Easily and fast attached to standard reflector by using a black retaining ring. Honeycomb grid filter enables light to emit in various directions and focus on a smaller area. Optimized MCU circuit design, more efficient energy conversion and more flashes. 1 second (full power). CANON flash light--580EXII 580EX 550EX MR-14FX MT-24EX. Compatible Model: V860IIN. Model Number: V860IIN Hot shoe. Model: V860IIN. New Hot Shoe mounting foot for God ox V860IIN Nikon Version Flash Speedlite repair fix parts. This hot shoe is designed for GODOX Flash Speedlite V860IIN Only. Multi-functional 45cm Umbrella Softbox Soft Box For WITSTRO Flash AD180 AD360 Product Features --- Compatible with Godox/Neewer WITSTRO Powerful Flash AD-180 AD-360 --- Including: One Softbox, One Diffusion Cover, One Honeycomb Cover, One Aluminum Disc --- Honeycomb Cover: Cover this octagonal softbox to control light spill and make the light soften and even. Add character eyes light. --- White Diffusion Cover: make light uniform diffusion, soft and natural. Product Description This 48cm/18inch, Godox Folding Octagonal Softbox produces soft and even illumination, widely used by professional or amateur photography on portraits, pets, jewelry or other products. When using for shooting portrait, will get attractive lights in the eyes. 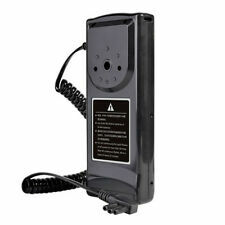 Capacity: 11.1V/ 2000mAh. New generic Li-ion battery. High energy density, high recycle life and long life-span. Quick light back speed goes ahead of similar products. Model: Godox VB-18. Godox AD-S3 Beauty Dish Reflector with Honeycomb Cover for Godox Witstro AD200 Pocket Flash Godox AD180 AD360 AD360II Flash Speedlite - Including PERGEAR Cleaning Kit. 1x Beauty Dish Reflector. Beauty Dish Reflector: Max. Godox AD-S3 Beauty Dish Reflector with Honeycomb Cover for Godox Witstro AD200 Pocket Flash Godox AD180 AD360 AD360II Flash Speedlite - Including PERGEAR Cleaning Kit. Dia 305mm, Height: 92mm, Weight: 310g. Optimized MCU circuit design, more efficient energy conversion and more flashes. 1 second (full power). We will do our best to turn any less than satisfactory experience into a positive one. 1 Shoulder Strap. AD200 dual power flash head is suitable for installing two Godox AD200 pocket flashes together to ahieve 400W power output. Godox AD200 AD-B2 Bowens Mount Double Tubes Light Head Bracket for Dual Power Flash Portable Ahieve 400W Output. Godox Witstro H200R Round Flash Head for AD200 200Ws 2.4G TTL Flash Ring Flash Head with Storge Box. Light & Portable Light & Portable: Weight as light as180g,an storge box make it more convenient for your outdoor shooting. Godox H200R is an optional round flash head for AD200 that provides a smooth and soft light. The spiral flash tube creates a natural and soft light. Optional flash head for Godox Ad200. LED pilot lamp 4.3W. Godox AD-S3 Beauty Dish Reflector with Honeycomb Cover for Godox Witstro AD200 Pocket Flash Godox AD180 AD360 AD360II Flash Speedlite - Including PERGEAR Cleaning Kit. Beauty Dish Reflector: Max. Dia 305mm, Height: 92mm, Weight: 310g. Godox AK-R1 accessories kit compatible for Godox H200R,Godox AD200 Accessories. Godox AK-R1 Accessory Kit for H200R contains magnetically-attached modifiers that maximize the capabilities of the head. Designed for WITSTRO AD-360 / AD-180 series of flash light. Functions as a beauty dish with the included aluminum sheet. Material: Aluminum & Acrylic Fibers. 1 Aluminum Sheet. 1 Carrying Bag. Model: AD-S7. Suitable for Godo Witstro series flashes. Box contents: 1 x HoneycoMB AD-S11 Standard Reflector for 1 x Filterfolien in 4 colours (red, blue, green, yellow). Fast and easily attached to standard reflector by using a black retaining ring to attach. New Godox AD-S6 Umbrella-type Reflector For Witstro AD180 AD360 Flash Accessory Introduction: Godox AD-S6 Reflector for WITSTRO flash AD180/AD360 Randomized reflective inner surface removes "hotspots" as light scatters around the inside Locks quickly into position and carries easily Throws clean and diffused light over longer distance. Easy to mount, you can mount this light directly to the AD200 flash unit. 1X 200W Bare bulb for AD200. LENGTH: 8cm. HEIGHT: 5.5cm. WIDTH: 5cm. Godox AD-S2 Standard Reflector with Soft Diffuser and ad-s11 Witstro Flash Speedlite Accessories for Godox AD200 AD360 AD360II Flashes. Compatible with Godox Witstro AD200 Pocket Flash Speedlite. While using the Godox AD200 Pocket Flash with the Godox AD-S2 ad-s11 Standard Reflector, you can achieve better light effects and shooting experience. Color: silver. Make sure this fits. by entering your model number. In the case of factory defects, we will replace the product for you. Model: AD-S18. We do our best to process as quickly as possible. Godox VB-18. Model: Godox VB-18. Capacity: 11.1V/ 2000mAh. New generic Li-ion battery. Godox H200R Round Head Godox AK-R1 Accessory Kit 2019 New Version. Godox AK-R1 Accessory Kit 2019 New Version Available Now ! Support to use: NIKON flash light –SB-800 SB-11 SB-20 SB-22 SB-24 SB-25 SB-26 SB-27 SB-28DX SB-80DX. Capacity: 11.1V/ 2000mAh. New generic Li-ion battery. High energy density, high recycle life and long life-span. Quick light back speed goes ahead of similar products. Model: Godox VB-18. No need for many AA batteries or power to take with extra. It adopts a magnetic accessory port to achieve simple and fast installation. Magnetic Port to provide the simple and fast installation.Abundant accessories to achieve more light effects. Godox AK-R1 Kit. Specially designed for Godox AD200 Pocket Flash. We stand behind our products.